When push comes to shove: David Lemieux and Spike O'Sullivan face-off ahead of their Saturday night clash on the Golovkin-Alvarez undercard. Photo credit: Ed Mulholland/HBO. 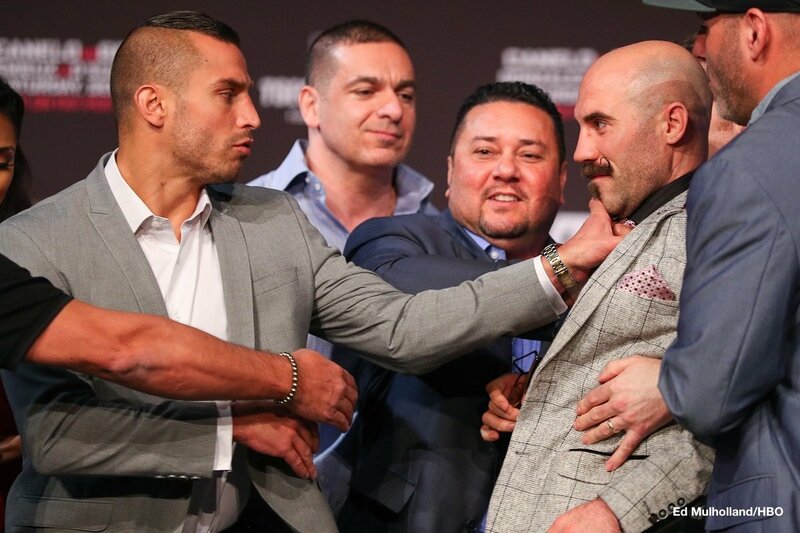 The weigh-in for Saturday night’s middleweight clash between contenders Gary ‘Spike’ O’Sullivan 28-2 (20) and David Lemieux 39-4 (33) ended in a minor scuffle between the protagonists after incendiary comments from both camps. After weighing in at 159.2lb at the T-Mobile Arena in Las Vegas, Nevada ahead of the fight on the Gennady Golovkin versus Saul ‘Canelo’ Alvarez undercard the 34-year-old Irishman taunted Lemieux, 160lb, claiming the Canadian power-puncher is scared of him. The pair continued to jaw at each other during the customary face-off for the photographers, leading to Lemieux giving O’Sullivan a shove. Former long-time middleweight champion and now Golden Boy Promotions executive Bernard Hopkins stepped in to separate the two. “Thank you everyone for coming and putting on this magnificent event. Smell that? I smell fear,” said O’Sullivan, the WBA and WBO number three, WBC number six and IBF number 14 ranked middleweight. The 29-year-old Lemieux, who is coming off a 12-round unanimous decision over Karim Achour in May after dropping a points decision to Billy Joe Saunders for the WBO title last December, lasted almost eight rounds with knockout artist Golovkin three years ago. “Vegas, we’re back. The biggest fight of the year is here. The talk is done. Now it’s time to walk the walk,” said Lemiuex, the WBA number four and WBO number five ranked middleweight, who is also rated at 168-pounds by the WBC at number seven. “His chin is going to be very warmed up for the fight – he’s gonna need it. He’s not going to stay in front of me, I’m ready for 12 rounds. If he passes eight rounds, respect to him. Lemieux stormed off stage after the weigh-in, allowing O’Sullivan to get the last word in. “I could smell the feat and I could hear his heart beating,” O’Sullivan told Cynthia Conte. “He was anxious and is shittin’ himself right now.